What you are about to read is still classified "TOP SECRET" by the United States Air Force. Now, after 60 years, the true story of the U.S. involvement into the design and construction of "Flying Saucers" can now finally come to light. This is not your run-of-the-mill "light in the sky" saucer story. In this case, the dates, names, and locations of very specific personnel and hardware can now be identified, which point to a very "terrestrial" explanation for many of the "UFO" sightings beginning since 1947. 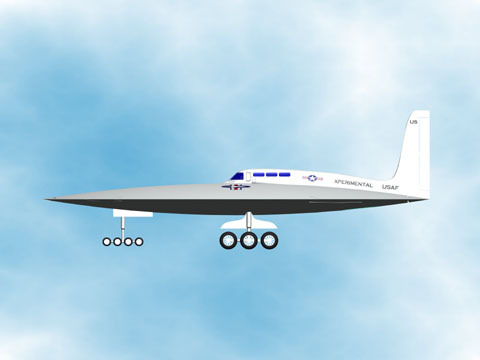 THE REAL STORY: The case for U.S. built flying wing disc aircraft (aka flying saucers) begins with an unprecedented true account by Mr. Jack D. Pickett (retired WWII combat veteran and publisher). During the 1960's, and on into 1972, Jack Pickett and his business associate Harold Baker published for the Air Force certain house-organ magazines (club-calendar-events) for NCO and Officer's Club facilities for several military bases in Florida. It was 1967 when the Adjutant General's Office at MacDill AFB (Tampa Florida) proposed a front cover, and two-and-a-half page article within. The subject was Vintage, Historical or Experimental aircraft. THEY DO EXIST: Jack and Harold learned that some experimental jet aircraft were being stored at the base salvage/scrap-yard. These particular aircraft had already been decommissioned/declassified, and were parked directly outside, and NOT in a hangar. In September of 1967, both Jack and Harold drove together to where these aircraft were being parked. Upon arriving at the chain link fence, which surrounded the perimeter of the base near the scrap-yard, Jack first saw the most awe-inspiring aircraft ever built. Jack's initial thought was: "My gosh! Those are Flying Saucers! Those things really do exist!". There, in outside parked storage, were four flying wing discs, measuring 20 to 108 feet in diameter. Because they were the last remaining of their model, the Master Sergeant of the Non-Commissioned Officer's Club telephoned the Adjutant General's Office for permission for polaroid photographs to be taken, even though all of the tires were completely flat down to their wheel rims. The General's Office (headed by base commander William M. Wilson) suggested that Jack use higher quality official Air Force photographs available at the Adjutant General's library at MacDill. Under armed guard, Jack was personally shown literally hundreds of official U.S.A.F. photographs of these aircraft in formation flight, on the tarmac, and was shown portions of motion picture footage of these aircraft in flight. Jack was allowed to select those photographs best suited for the up-coming NCO Club newsletter article, and obtain additional detailed information concerning the discs. It's important to note, that these four aircraft are NOT to be confused with the well known Avro VZ-9 Avrocar, Chance Vought V-173 "Flying Pancake", Project Silverbug, or the Chance Vought XF5U-1. DESCRIPTIONS OF THE DISCS: When Jack first saw the official USAF photos of these aircraft, he was amazed, and immediately asked questions regarding how large, and how many of these aircraft were built. Jack also inquired about the flight performance (altitude and cruise speed) for these aircraft. Some of the in-flight photos clearly showed the discs being escorted by an F-84 Thunderjet (straight-wing) interceptor aircraft. Looking head on, they appeared as the classic so-called "Flying Saucer" shape, very similar to two saucers stacked one over the other. 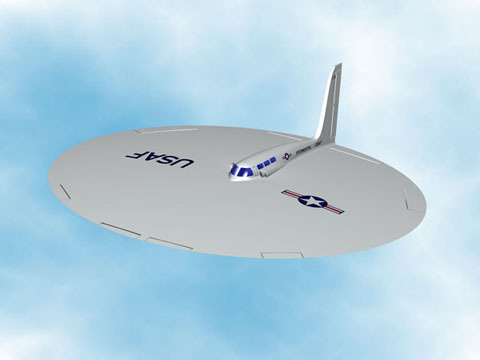 The pilot/crew compartment appearing as a bubble shaped contour located directly in the middle of the top of the disc. There was nothing forward of the pilot's compartment other than the sloping surface. That compartment tapered back towards the trailing edge of the disc, narrowing down to a high vertical tail. The small 20' diameter craft had a crew of one, with an air-intake on both sides of the pilot's compartment, and two exhaust ports at the aft lower portion of the disc. This aircraft also employed control surfaces along the circumference of the disc. According to Jack, the smaller disc seemed to incorporate a sort of magnifying/enlarging optical sight, which was directly embedded into the 1-1/2 to 2" thick canopy windows. The standard Air Force insignia, and the word "XPERIMENTAL" followed by "USAF", was visibly printed starting immediately behind the windows of the compartment on towards the tail. All four discs were polished aluminum silver in color, with the aircraft skin seams and rivets clearly visible. Amazingly, each aircraft was so exceedingly streamlined that it appeared as though each craft were made out of one piece. The discs themselves, regardless of size, all had tricycle landing gear. The size of the aircraft, determined how many wheels on each. According to the O.I.C. (Officer in charge) of MacDill, all four aircraft had been flown in, and then immediately parked outside at the scrap-yard. The O.I.C. also informed Jack that not one person had ever been allowed to enter any of the discs since they arrived. THE LARGE DISC: Measuring 108 feet in diameter, and standing 12' off of the ground, the largest of the four discs must have been a sight to behold. The O.I.C. permitted Jack to walk under and around this aircraft, and was actually allowed to kick the tires of the smaller 40' craft, while the O.I.C. stood nearby and snapped a photo in the process. Jack specifically noted that the port main landing gear was partially collapsed, causing the aircraft to lean to the left. Each main landing gear consisted of 6 wheels, measuring 5' in diameter. The nose gear had an incredible 32 wheels, each measuring 2-1/2 to 3 feet in diameter. A door was located on the port side of the craft, for access to the crew compartment. Immediately behind the door, were three windows that ran along both sides of the fuselage. These may have been stations for the flight engineer, navigator, and weapon systems operator. The large craft employed two air-intakes on both sides of the crew compartment, and four exhaust ports at the aft bottom end of the craft. The air intakes blended beautifully into the sides of the fuselage and upper portion of the disc. Jack specifically recalls that the unusually high vertical stabilizer was "higher than shopping mall parking lot lights". It was evident that the landing gear retracted inside the main body of the disc, with the gear moving up and away from the centerline of the aircraft. Flight control surfaces were located along the circumference of the disc, similar to the 20' model. Jack remembers seeing what may have been bomb bay doors located on the bottom surface of the disc. These may have been used for the release of 10' diameter in-flight radio controlled flying wing disc bomb drones. Indeed, Jack remembers seeing flying wing disc drones in various stages of disrepair at the scrap-yard, near the four discs. These bombs were capable of being delivered with "pin-point" accuracy decades before Lockheed F-117 Stealth Fighters dropped "smart bombs" on Iraq during the Gulf War. This indicates that the primary mission for this aircraft may have been that of a long range reconnaissance bomber. Jack was told that this aircraft regularly over-flew Russia after WWII, but was told: "you can't print that". AIRCRAFT PERFORMANCE: When Jack asked the O.I.C. if these were the Flying Saucers everybody was reporting, he was given an affirmative reply. It's clear that what was being reported, was one of the smaller craft, specifically the 40' diameter model. The overall logistics and tremendous costs involved in manufacturing the giant 108' model may have prevented it from being produced in great quantity. Jack Pickett was never briefed on the exact propulsion system utilized by the four craft, or who specifically built these aircraft, and any guess would be pure conjecture. However, Jack was told that these aircraft could fly so high, and so fast, that they were actually capable of achieving space flight. By definition, that would eliminate conventional jet engines, due to their tendency to "flame-out" at extremely high altitudes. This would mean that these aircraft were capable of literally flying rings around anything operating at the time. With a top speed of 15,500 mph, and an almost unlimited range, they definitely still remain among the utter most classified aircraft in the U.S.A.F. inventory. Jack also inquired why they had been discontinued, and was told that it had to do with maneuverability problems, and that the U.S.A.F. now had "better ones". THE PROPOSED ARTICLE: The four disc shaped experimental aircraft were never featured in the October 1967 issue of "NCO Club News". Coincidentally, while putting that article together, there was a UFO/Flying Saucer sighting which occurred directly over downtown Miami. That particular aircraft Jack was told, originated from Avon Park Air Force Range located 100 miles Southeast of MacDill AFB. Avon Park consisted of runways far too short for the operation of conventional high speed horizontal take-off aircraft. Only "harrier type" or VTOL aircraft would be ideally suited for operations at this facility. Jack learned that this new prototype developed a propulsion system malfunction, which caused it to drop down to "tree-top level". Eventually, the flight crew regained control regained control of the aircraft, which quickly departed the Miami area at a tremendous speed. It's entirely possible that a more advanced prototype VTOL variant of the original four discs stored at MacDill was responsible for the over-fly of Miami. Jack brought this sighting, which took place during September of 1967 to the attention of the O.I.C. at MacDill, who personally felt that he should make a request to higher Air Force authority for the clearance needed for publication at that time. This was now the making of the biggest, and most decisive "catch 22" that the U.S.A.F. ever found itself in. On one hand, the Air Force was standing on the door-step ready to officially release information pertaining to the four discs parked at the scrap-yard which had already been decommissioned/declassified. On the other hand, it was determined that the Air Force would never admit to the existence of the aircraft which took off from Avon Park, and was responsible for the Miami sighting. Jack was specifically told that it would be in the "better interest of the Air Force" to delay publication of his article. THE CANADIAN CONNECTION: During WWII, Germany had become the undisputed leader in highly advanced aircraft technology. The Me-262 jet interceptor, Horten flying wings, and the Me-163 rocket powered aircraft were decades ahead of allied designs. Under the direction of General Hans Kammler, the man in charge of operations at Peenemunde, and Dr. Wernher von Braun's boss, a secret saucer program was started in Dresden in 1942. This design team, headed by Dr. Richard Miethe, was ultimately responsible for the manufacture of the incredible discs that Jack Pickett saw at MacDill AFB in 1967. It can now be revealed, that these discs had been originally built in Germany in the fall of 1943, with the first flight occurring during the spring of 1944. After the close of WWII, many German aeronautical engineers were sent to White Sands Missile Range under "Operation Paperclip". The remaining group of scientists, were captured by the Russians. Dr. Richard Miethe was among the group captured by the Red Army. Eventually, Dr. Miethe escaped from Russia, and went to work for John C. Frost of the Avro Aircraft Company in Malton Ontario Canada. Mr. Frost was a gifted aircraft designer from England, who headed up Avro's "special projects group" in 1952. Avro was currently working on at least 16 different "Flying Saucer" proposals, including project "Y" and project "Y2" (aka "Project Silverbug"). 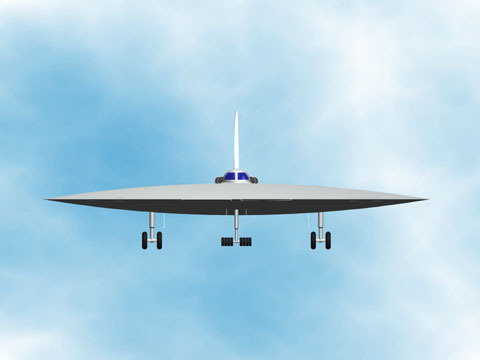 Project Silverbug was a design for a supersonic VTOL flying disc. By 1953, John frost and his team had completed most of the "paper studies" on these highly unusual aircraft. The only problem facing Mr. Frost, was the overwhelming costs involved in the development of these designs. It quickly became clear that only one country was capable of providing the necessary "financial backing" to "foot the bill" for Avro's flying saucer programs. USAF Lt. General Donald L. Putt had been briefed on the incredible performance specifications of these aircraft, and visited the Avro Canada plant on September 16, 1953. Not wanting this incredible technology to be acquired by any other nation, the U.S.A.F. officially took over and financed Avro's saucer program in late 1954. This allowed the Air Force to "farm out" it's own saucer program on foreign soil, while at the same time keeping the project strategically close to the United States. By 1955, Dr. Miethe had completed construction of the disc shaped aircraft he had originally built in Germany in 1944. 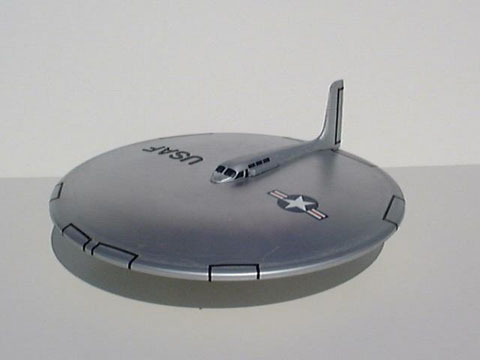 These were the exact aircraft reported as "flying Saucers" in the U.S. during 1947. The first test flight of this USAF/Avro disc occurred in Malton in 1955, with additional test flights taking place at Edwards AFB. Now we know who built the "Flying Saucers" that Jack Pickett saw at MacDill AFB in 1967. Mystery solved! WHERE ARE THEY NOW: Fortunately, the story doesn't end in 1967. Jack was informed that the four discs parked at the scrap area were the very last of their kind, and were awaiting orders to either be scrapped, or flown/transported to Offutt AFB for storage for the yet-to-be-completed Air Force Museum. This brings us to Mr. Warren Botz (retired WWII P-40 Warhawk Flying Tigers pilot) who in 1978 was attending a reunion with his fellow pilots at Wright Patterson AFB. A small group including Warren, were transported by bus across the base to where the restoration hangar is located. It's here that various older aircraft are processed, and made ready for the Air Force Museum. Warren momentarily departed from his group, and managed to walk into a restricted hangar adjacent to the restoration facility. Taking up the entire hangar, was the identical craft Jack Pickett saw at MacDill AFB in 1967. Through telephone conversations with Mr. Botz, it became apparent that what he saw was one of the smaller 70' diameter craft. Warren was only in this hangar for about two minutes, but was able to confirm many of the details mentioned by Jack Pickett 12 years earlier. Mr Botz clearly remembers seeing the tricycle landing gear, along with the very high vertical tail. In fact, after seeing the illustrations used for this article, Warren declared: "that's the exact aircraft I saw at Wright Patterson AFB". The time has come for the U.S.A.F. to fully declassify and release into public domain, the technical details, photos, and motion picture/newsreel footage pertaining to these specific aircraft. Any potential threat to National Security has now been far out-weighed by the economic and environmental benefits derived from the propulsion systems employed on these aircraft. Indeed, we can no longer as a civilization, go on using obsolete solid and liquid rockets to achieve space flight. There is a "better way" to access space. It's now time for the military industrial complex, and the highest level of U.S. leadership to finally admit that "the game is up", and that the American people, and the world, demand a full disclosure regarding highly classified aerospace vehicles and propulsion systems. Only then, can we all take our rightful place among the stars, and fully reach our potential to discover new worlds, just over the horizon.